To encourage connection and awareness of nature, my epidemiologist friend, Jana, focuses on resilience building using local organic gardening. Her social enterprise works on connecting people to the environment by growing local food close to home. She has experience engaging with children of all ages and now partners with our local school board as a “content expert”. 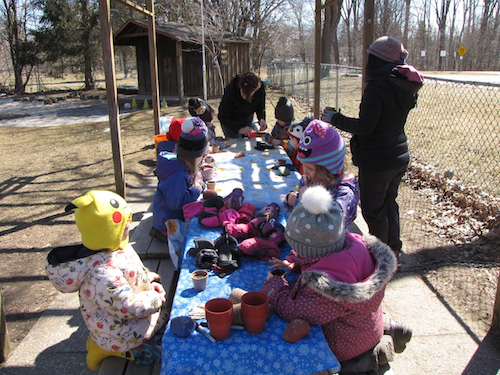 Over one weekend, we teamed up to design a lesson plan for a junior kindergarten veggie seedling workshop, which we later hosted at my daughter’s preschool. The flow and focus of the lesson, the materials needed and how to acquire them were included in our lesson plan. On the day of the workshop, we set up and explained the process and reasoning for the setup to the teachers. I labelled some pots with the children’s names, and noted either carrot or tomato, as each child would get to plant one of each. Ms. Grace, the co-owner of the school, wanted to cultivate the idea of being responsible. 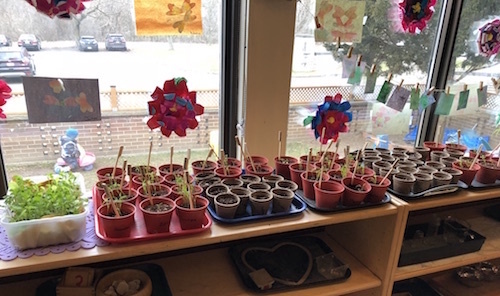 To help foster this, the workshop encouraged each child to nurture one tomato plant and one carrot plant, which s/he would eventually take home and plant in his/her garden, or transplant into a larger pot. However, the children would collectively take care of the salad box at school. We started off the workshop talking about cycles, seasons, and the conditions for growing seeds. Several kids told me that they had their own garden at home. They expressed feelings of enjoyment and their love of being outdoors. They also seem to really enjoy nurturing plants and observing seeds grow into seedlings. To communicate the concept of biodiversity, we showed them a variety of seeds for their classroom salad box. Jana showed them the carrot seeds they would be planting next. With a big whoooosh, the wind blew away the carrot seeds. Jana said, “This happens all the time and the key is to come prepared,” as she pulled out another pack of carrot seeds from her pocket. The children oohhhhed and ahhhhhed at the size of the teeny tiny carrot seeds. I then showed them how to scoop the soil with their pot and to gently agitate it to settle the soil. Germination rates are never 100% and to ensure that each child would have a seed that germinated, Jana gave three seeds to each child. By the time we finished planting the tomatoes, it was close to their snack time so the teachers wanted us to split the remaining children into two groups. Previous experience dictates that any activity with small children requires adjusting according to the circumstances. The remaining two groups went quicker as we had found our rhythm with the first lesson. The end result was three trays of plants with each child’s name and the type of plant individually labeled! As I mentioned in my previous blog post, my hope for the lesson was that these feelings that manifested in this nature-building opportunity and others along the road would endure into the future and create more environmentally-minded and nature loving citizens.